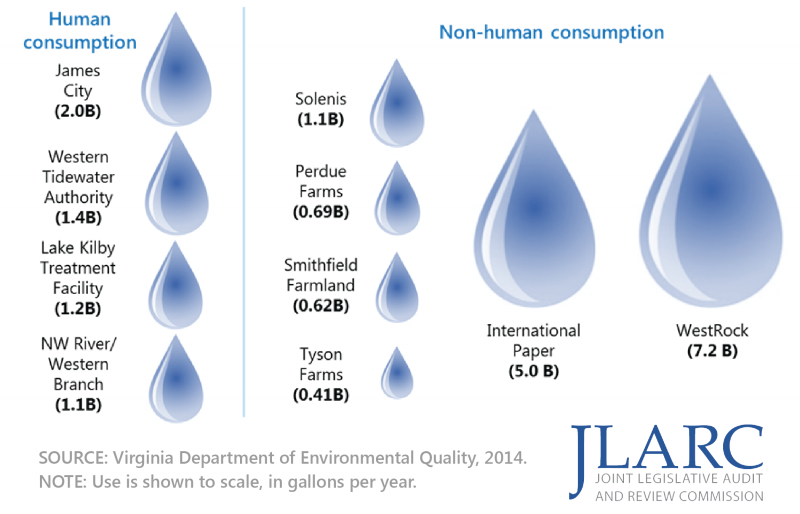 In 2015, the General Assembly directed the Joint Legislative Audit and Review Commission (JLARC) to review Virginia’s water resource management and planning. Interest in this topic was prompted by concerns about the sustainability of water supply and demand, especially in eastern Virginia. Water resource planning and management seeks to ensure that water supplies will be available to meet human and environmental needs. This planning and management is accomplished through state and local plans, state permitting, and locally developed water supply projects. Recent efforts by the Department of Environmental Quality will, if successful, bring current use of groundwater in eastern Virginia to sustainable levels. This sustainability, though, is tenuous because of the strong likelihood of growth in permitted and unpermitted use. Sustainability concerns have already negatively affected municipal water supplies. This tenuous sustainability means that there is currently insufficient groundwater in eastern Virginia to accommodate any major, new permit requests. According to analysis conducted for this study, new permit requests (for example, requests by industries seeking to locate in the region) for even a moderate amount of groundwater cannot be accommodated. Virginia’s state and local water plans are not sufficiently specific or aligned with water location and use. As a result, the state lacks a clear plan for addressing its most pressing sustainability challenges. The first ever state water plan was a major undertaking that has improved the state’s understanding of how water is currently used throughout the state. However, the plan does not adequately define the state’s water challenges and lacks detailed and actionable strategies to address those challenges. Many of the local water plans have been useful to local stakeholders, but localities did not sufficiently collaborate to develop regional plans. For example, Richmond, Henrico, and Chesterfield did not coordinate their water resource plans, even though they all use the James River as their primary source of water. Without regional planning, localities may miss opportunities to collaborate on high-cost water supply projects, and some localities may have greater access to water than others. Despite statutory language underscoring that human consumption is the priority, more than 60 percent of all current permitted groundwater use in eastern Virginia is for industrial purposes. The Code of Virginia and the Virginia Administrative Code clearly establish that water withdrawals for human consumption should receive the highest priority when withdrawal permits are granted. Substantial industrial use of low cost, high quality water has the effect of “crowding out” higher priority use for human consumption. This crowding out is contributing to one municipal water authority embarking on a $128 million water supply project to develop alternatives to groundwater. The cost will be passed along to residents and businesses that are connected to this municipal water supply. Without substantial changes to the state’s groundwater permitting process, this crowding out and higher costs to residential customers and businesses will continue. A combination of conservation and additional water supply projects can help address the state’s sustainability problems. Relatively simple conservation measures, and more complex projects such as fixing leaking water infrastructure, may be the simplest and least expensive ways to ensure that supplies can meet demand. Municipal water authorities lose between 4 percent and 50 percent of their water through leaks, and repairing infrastructure can result in a considerable net increase in available water supply. In addition, a proposed aquifer injection project in eastern Virginia has the potential to substantially increase the coastal aquifer water supply, but its full implementation may take decades. The primary benefit of the injection project is that it would have sufficient scale to substantially increase groundwater levels. A more active state role in project planning can help ensure that conservation measures and fixing leaky water infrastructure are sufficiently considered before embarking on costlier, higher-risk projects. If the state continues to take a minimal role in the planning of water supply projects, projects may be developed that are unnecessarily costly or high-risk. The state role in the financing and construction of water supply projects is also minimal, but Virginia’s sustainability challenges are not significant enough to justify materially changing this role.